SUBHEAD: It's unlikely that the Libertarian or Green candidates will get another chance to share a stage. Image above: Presidential candidates Gary Johnson (L), Jill Stein (G), former President Bill Clinton representing Hillary Clinton (D) and Utah Attorney General Sean Reyes representing Donald Trump (R). From original article. Thanks to the Asian American Journalists Association (AAJA) and Asian and Pacific Islander American Vote (APIAVote) for putting together the 2016 Presidential Election Forum. 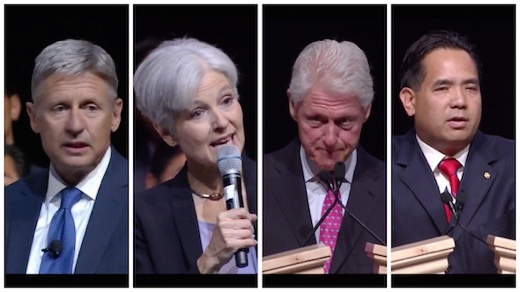 The quad-partisan forum marked the first time in this election cycle that the top four presidential campaigns participated in an event together. The Republican, Democratic, Libertarian, and Green Party presidential campaigns were all represented. Let’s hope it won’t be the last time. So what did we learn? We have four horses in the race. But only two have a realistic shot to win: Hillary Clinton and Donald Trump. Still, having Green and Libertarian Party candidates on the same stage as representatives of the Democratic and Republican campaigns is a positive development. And something that should be celebrated. The next step is getting all four campaigns on the same debate stage in prime time. Baby steps to democracy. We have to start somewhere to fix a corrupt system. 2:29 p.m. PDT: “Will this be a wasted vote?” asks interviewer Richard Lui. I do support TPP. Is it a perfect document? No, nothing really is ... my advisers have told me that this does make things better. Lui notes that Johnson has been labeled “Governor No” for his use of the veto to kill legislation. “What will you say no to” as president, Lui asks. “No new taxes,” Johnson says. 2:50 p.m. PDT: Johnson explains his solution to education funding: giving control back to the states. “By eliminating the Federal Department of Education” there will be more money for the states, Johnson argues. “I don’t think any of us are different, I think we all have common goals here.” Johnson argues that entrepreneurship should be encouraged more in the United States. 2:52 p.m. PDT: The interview wraps up as Lui asks Johnson what family means to him and what his father taught him. Next up: Green Party presidential nominee Jill Stein. 3:01 p.m. PDT: I will be taking over the live blog for Emma Niles. If you want to watch a broadcast of the town hall forum in Las Vegas, click here. 3:04 p.m. PDT: Dr. Jill Stein takes the stage. Stein is the Green Party presidential nominee. She is representing mothers, doctors and citizens of the planet. “Will we have a planet going forward?” she asks. Fair question. 3:08 p.m. PDT: How does Stein define her party in one sentence? The Green Party is the only party that can stand up for people and peace over profits. Stein is calling for a Green New Deal that fixes the crisis of the economy and the crisis of the environment. Recently, Truthdig political correspondent Bill Boyarksy talked with Stein, and she laid out the Green New Deal in more detail. 3:12 p.m. PDT: How would we pay for the green energy transition? Stein says it will pay for itself. Lui is skeptical. Stein makes the case: (1) Cut the wars for oil. (2) We get healthier when we zero out the polluting fossil fuels. 3:14 p.m. PDT: Stein has come up in the polls from being a nonfactor, almost invisible, to now polling at 5, 6 and 7 percent. “Democracy needs a moral compass,” Stein says. The Republican Party is eating itself. The Democratic Party is fractured. Stein is talking about how the Democratic primary was rigged in favor of Hillary Clinton. And the feed goes down. Coincidence? 3:18 p.m. PDT: The way Stein talks is refreshing. We need a politics of integrity. She says 42 million young people have student debt and she wants to wipe out all of that debt, the same way Wall Street got bailed out. How will she pay for it? Quantitative easing. The Fed buys up the student debt and cancels it digitally. Lui calls it the “magic eraser” and says many people don’t like that. Stein is unmoved and wants to create the economy of the future. 3:25 p.m. PDT: What is Stein’s favorite green energy source? Solar power. Go solar. Lui is a fan of wind power. Having a wind turbine in the backyard is a little more difficult than installing solar panels on the roof. 3:27 p.m. PDT: Stein wins points with the Asian community. Stein knows what AAPI stands for: Asian American Pacific Islanders. 3:30 p.m. PDT: Talk turns to feminism. Women deserve equal rights. Stein is all for gender equality and wage parity. We need a national federal minimum wage of $15. How important is it for men to be feminists? In Stein’s view, feminists are humanists. 3:32 p.m. PDT: Is it time for an Asian-American Supreme Court justice? Stein says yes. Lui tells her to stop pandering. “Test me,” Stein says. 3:34 p.m. PDT: No hardball questions here. “What does family mean to you?” Richard Lui asks Jill Stein. It is the same questions he asked Gary Johnson to close his interview. There is no wrong answer, and she gets the answer right. Family means love, connection. We are connected by community, cultures, nations. We are all on one small boat: planet earth. We are all part of the same human family, striving for human rights and justice. Stein says her parents taught her to have a backbone and to stand up for what is right. She talks about growing up in an immigrant Jewish family after the Holocaust. That is when she was introduced to doing the right thing and standing up for the right thing, even if the position may be unpopular. 3:37 p.m. PDT: That’s all for Jill Stein. If you want to learn more about her, she stopped by the Truthdig headquarters in Los Angeles on June 7, the same day as the California primary. Here’s a behind-the-scenes look at her visit. 3:45 p.m. PDT: What happens in Las Vegas today, we want the whole world to know. Hillary Clinton couldn’t make it to the town hall event, so she sent her husband to represent her. He is not complaining. Sin City is his kind of town. 3:52 p.m. PDT: William Jefferson Clinton has arrived. The woman who introduces him tells everyone to welcome Bill Clinton by giving him a hug. She must not have gotten the memo from the Hillary camp: No touching allowed. It’s like the sign at the zoo says: Do not feed the animals. Up next is Bill Clinton, the 42nd president of the United States. 3:55 p.m. PDT: Clinton gets the podium all to himself. 3:56 p.m. PDT: Clinton gets the crowd fired up by talking about building potential for the future that allows people to give themselves better lives and give their children better tomorrows. He’s done this before. We need to create more and better jobs and accelerate the formation of small businesses. Since the collapse happened on the watch of President George W. Bush at the end of two full terms in office, many in the Democratic Party were only too eager to blame his administration. Yet while Bush did nothing to remedy the problem, and his response was to simply reward the culprits, the roots of this disaster go back much further, to the free-market propaganda of the Reagan years and, most damagingly, to the bipartisan deregulation of the banking industry undertaken with the full support of “liberal” President Clinton. Yes, Clinton. And if this debacle needs a name, it should most properly be called “the Clinton bubble,” as difficult as it may be to accept for those of us who voted for him. 3:57 p.m. PDT: A mayor, governor and United States senator—Bill Clinton is talking about Tim Kaine, Hillary Clinton’s running mate. 4:01 p.m. PDT: Clinton is sticking to the script and hitting all of the talking points: student debt, education, small business loans. He doesn’t want to upset Hillary. You won’t like her when she’s angry. He knows. 4:10 p.m. PDT: According to Bill Clinton, the unemployment rate with people with college degrees is 2.4 percent. He then acknowledges that there are 1 million jobs for plumbers, welders, construction workers—working-class jobs. Many people don’t have the training to work these jobs. Hillary wants to change this. 4:12 p.m. PDT: Hillary Clinton promises to provide a new path to citizenship for immigrants in the first 100 days of her presidency, Bill Clinton reminds us. She is determined to bring stability and sanity to this issue. Sounds great. What’s not to trust? 4:18 p.m. PDT: Bill Clinton gets serious. Walls or bridges? That will be the metaphor for this election. Are we stronger together or stronger apart? Our diversity is a blessing. We can live together. Hillary can grow our economy and lift the world to a better place. As a politician, Bill Clinton is a pro and talks a great game. The key question as always is this: Can you trust the rhetoric? Will the actions mirror the words? Will the Clinton do what they say? Or will they say one thing and do another behind closed doors? Let’s just say we’re not going to bet the farm on taking the Clintons at their word. They need to earn the trust of the people and regain the trust of the people. If that is possible. 4:26 p.m. PDT: Vote Hillary Clinton for 30 years of prosperity. Bill Clinton’s talk in a nutshell. 4:27 p.m. PDT: Time for audience questions. The first one is no softball. Will the Trans-Pacific Partnership promote your values? To create better allies and strengthen American values globally? Would you support the TPP? “That’s a very adroit way you asked the question. Congratulations,” says Bill Clinton. It’s a difficult issue, Clinton explains. Hillary does not support the latest version of TPP, he says. These things have political consequences that go beyond the economic consequences. The United States has proven extremely vulnerable to profitable job loss, that is jobs that are doing well in our country. We have too many companies in American that are dominated by shareholders that want quick returns. All these trade deals that don’t deal with currency valuation changes are not solving the problem. I signed over 300 trade deals. I was in favor of more trade. I understand why there is more resistance to multinational trade agreements instead of country by country deals. Corporations have sold out the American people. The reason that Hillary has opposed this. We don’t have enough stakeholder-driven corporations. We have too many shareholder-driven corporations. The real nub of this problem is the intersection of a trade agreement with countries that want to keep their good jobs in their country and they still want to make American goods. We are dominated by a stockholder mentality. We are not protected by currency manipulation. In other words, a very political answer. Sounds smart, but really, a lot of words that don’t say much. Translation: Of course, Hillary skirted the rules. She’s a Clinton. I taught her the art of obfuscating the truth. But if we admitted to all the wrongdoing we have done over the years, there’s no chance we would get back to the White House. We don’t want that. The establishment doesn’t want that. So we will keep bobbing and weaving, ducking and jiving, slipping and sliding until we can return home to 1600 Pennsylvania Ave.
4:35 p.m. PDT: The music begins to play. Time for Bill Clinton to go. They have other speakers. He wants to answer one more question. He’s still got juice. They turn the music off. 4:37 p.m. PDT: The last question is about the emails. Hillary Clinton’s emails. “It’s the biggest bunch of bull I’ve ever heard,” Bill Clinton says. The emails weren’t relevant, he continues. He names a bunch of people who are supporting her, including people from the National Security Agency, the CIA and on and on. Would everybody who worked with her be for her if she wasn’t trustworthy? But what if the people who support her aren’t trustworthy. 4:51 p.m. PDT: Utah Attorney General Sean Reyes is here to speak on behalf of his candidate, Donald Trump. Reyes has a sense of humor. He takes a selfie. 4:54 p.m. PDT: Time for an etymology lesson. What’s in a word? Politics. Reyes explains. Poli means “many.” Tics are “blood-sucking insects.” Politics is all about blood-sucking insects. Reyes seems like a nice, normal person. Maybe Donald Trump isn’t the crazy demagogue everyone says he is? 4:57 p.m. PDT: Who thinks karaoke should be an Olympic sport? Sean Reyes will be here all week. Please tip your waitresses. 4:58 p.m. PDT: For being a Trump surrogate, Reyes hasn’t said much about Trump. That changes. “Donald Trump sends his thanks and appreciation,” Reyes says. Short and sweet. Less is more. I think it says a lot about Donald Trump and Mike Pence that they would let an average person like me speak to a special group like you. 5:07 p.m. PDT: Reyes reiterates the data about unemployment and the economy that Donald Trump used during his speech at the Republican convention. Nearly 14 million have left the workforce since Obama took the oath of office in 2009. Household incomes are down $4,000 since 2000. Reyes says the 5 percent unemployment number bandied about is a big hoax. Trump will make the American economy grow. Trust them. 5:12 p.m. PDT: One of the keys to public speaking is delivery. Reyes is saying the same things Trump says, but with less fire, brimstone and spittle. 5:19 p.m. PDT: Reyes wants to clarify some things Trump said about the Philippines, and Reyes says he has the full authority to do so. Trump welcomes law-abiding Filipinos. Trump was talking about terrorist elements that exist in the Philippines. Trump promotes legal immigration. Don’t ever forget, Trump is a humanitarian. He is the biggest and best humanitarian in the history of humanitarians. 5:27 p.m. PDT: What would a pro-Trump speech be without a little Hillary Clinton-bashing? 5:28 p.m. PDT: Reyes doesn’t agree with everything Donald Trump says, but Reyes wants a new future, not the status quo. He wants a visionary leader. Trump is that leader, says Reyes. But he will not be taking questions because he has a plane to catch. Couldn’t they hold the plane? He ends with a rap. Don’t mess with Reyes. That was worth the price of admission. 5:29 p.m. PDT: Reyes told his personal story as an Asian-American and Pacific Islander. He spoke from the heart. But did he convince anyone to support Trump? 5:33 p.m. PDT: The live stream wraps with analysis from Jason Chung from the Republican National Committee and Politico’s Seung Min Kim. Chung thinks Trump will be the next president. Do we want four more years of the last eight years? Or do we want a change? Chung thinks people want a change. Polls are painting a different picture. We’ll see what reality shows.